The Sirius is a classic collection from Swiss watchmaker Chronoswiss and it contains many different models. Over the last year Chronoswiss introduced various new models, including the Sirius Big Date Small Seconds, a fine dress watch which comes in two different versions – in stainless steel and red gold. We will take a closer look at this new timepiece in a longstanding tradition. The timeless elegance and unterstatement of the exterior appearance is enhanced with good readability and a large date. As with all Sirius models, the case back made of robust sapphire crystal allows you to look right into the mechanical movement of the watch. Chronoswiss was the first brand to equip their wristwatches with glass case backs as a standard feature. The stainless steel case measures 40 mm in diameter and 10.35 mm in height. it is partly polished, partly equipped with a satin finish. It is water resistant up to 3 atm. The watch features central hours and minutes, small seconds at 6 o’clock and thanks to its clear design and big date display at 12 o’clock, this timepiece guarantees excellent legibility. The Sirius Big Date Small Seconds is a beautiful example of Chronoswiss’s love for detail. 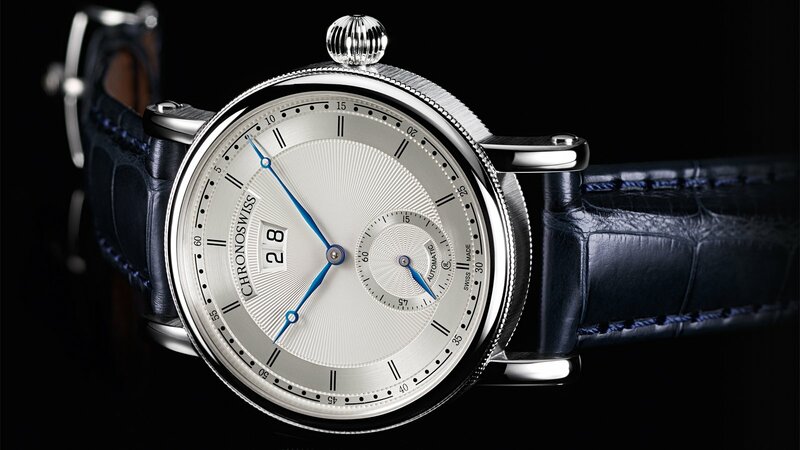 The length of the thermally blued and hand-finished hour and minute hands is coordinated precisely with the dial made of solid sterling silver, which impresses the beholder with its classy guilloche design. In addition, the minute hand has slightly been bent by hand so that it really points exactly to the corresponding markers on the dial. 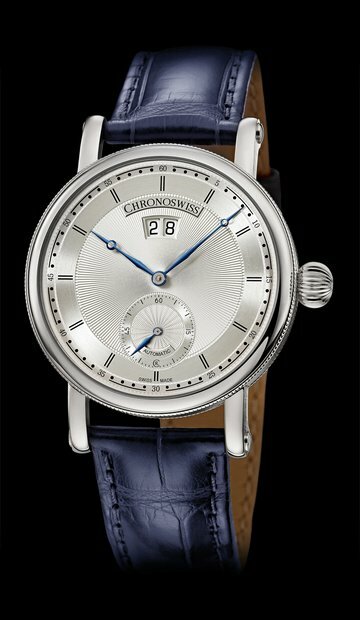 This Chronoswiss watch is powered by the caliber C.284 (based on the ETA 2892), an automatic swiss made movement which operates at 4 Hz. It provides a power reserve of approximately 42 hours. The strap is made from Louisiana-alligator leather and comes with a pin buckle or folding clasp. The Chronoswiss Sirius Big Date Small Seconds in red gold is featuring a brown leather strap. This entry was posted in Uncategorized and tagged automatic movement, Chronoswiss, date display, guilloche, Leather Strap, Men's Watch, sapphire crystal, small seconds, swiss made, wristwatch by admin. Bookmark the permalink.